The aim of any management team is to become a core group of people whose capabilities lead to their company’s success. Alexey Trigolos is reasonably considered one of the best Elinext Group's experts and farseeing leaders who have being providing a significant input in sustaining company's vision and prosperity. Alexey’s career ladder is like his personality: energetic, optimistic, investigative, constructive, and always leading to tangible results. Alexey Trigolos holds a degree in Applied Mathematics and Computer Science from the BSU. His experience in growing technology companies such as Euclid Competence Center, Crona IntSep, Viaden combined with his management and business analytics expertise made him an ideal person to take a position of IT Services Director at Elinext Group. 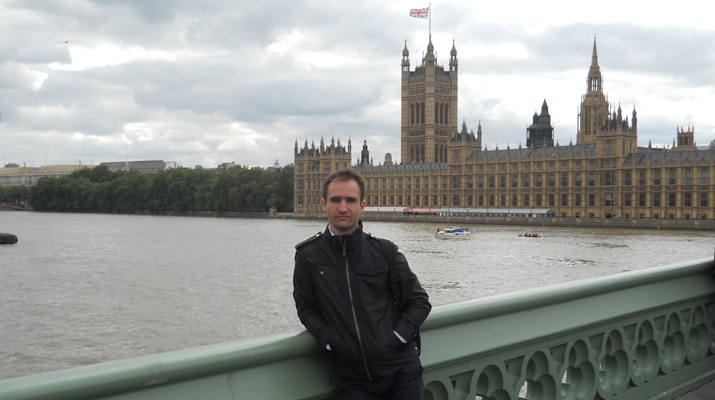 Alexey has gone all the way since the origin till today’s development of Elinext Group. He is responsible for the management of the projects related to web solutions and IT infrastructure management. One of the most significant projects he has been working on is long-term partnership with CA Technologies. Over the years together with Elinext Group, Alexey has proved to be an active, hardworking, reliable, decisive person who is always ready to meet any challenges with strong mind and professional approach. This person has a unique ability to find common points of view and compromise either with customers or team staff achieving effective workflow and high results. Throughout all his career, Alexey guides his activity by principles that expand the boundaries and go beyond programming. He is absolutely sure that creative intelligence in conjunction with diligence move every person to outstanding achievements. He takes his life journey easy and at the same time has a philosophical view of life. According to his opinion, it’s vitally important for every person “to discover your own destination, choose the right way, listen to the voice of your heart and move confidently to your goals”. Alexey’s personal points of interest are rather fascinating and are closely connected with emotional lift and mental harmony at the same time. Among the most significant spheres of his interest are spirituality, martial arts, snowboarding and windsurfing. Moreover, he is entitled to the black belt and third dang in Vat-Djitsu (Bong Dem Long martial arts school).